Nuremberg’s famous Christmas market, considered by many to be the world’s most beautiful Christmas market. 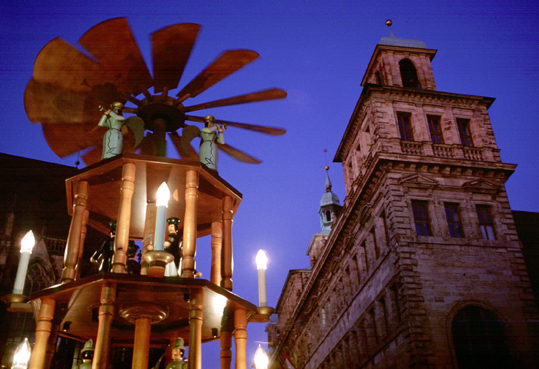 Younger visitors will enjoy the Kinderweihnacht (Children’s Christmas Market) where historic steam-powered merry-go-rounds and other activities are waiting for them. The Sternenhaus (House of Stars) across the street offers an exciting entertainment program. Lebkuchen (spicy gingerbread). Nuremberg’s Bratwürste (roast sausages) are delicious all year round – whether as street food served in a roll (Drei im Weckla – Three in a Roll), or sampled in one of the historic Bratwurst restaurants in the Old Town or in one of the city’s many beautiful beer gardens. Every year, Germany’s most famous Christmas Market opens its stalls for visitors from all over the world, right in the middle of the city, on Nuremberg Main Market Square. At 5.30 p.m. on the Friday before the first Advent Sunday, the Christmas Angel opens her market, reciting the solemn prologue from the gallery of the church of Our Lady. And as every year, by Christmas Eve, more than two million visitors from all over the world will have sampled the delights of the Christmas Market. Nuremberg spicy gingerbread, fruit loaves, bakery goods and sweets, typical Christmas articles such as Christmas tree angels, cribs, Christmas tree ornaments and candles, toys as well as arts and crafts products. Favorite souvenirs include “Nuremberg Plum People”, little figures made from prunes. And of course, by way of refreshments, there are always rolls with Nuremberg roast sausages and mugs of mulled wine (Glühwein). The staff of the Market Department keep a watchful eye on the stalls and the goods on offer. So plastic fir garlands are a no-no, just as much as non-stop taped Christmas muzak or carousels. The market’s stall holders also compete for the most beautiful and tasteful stall design. 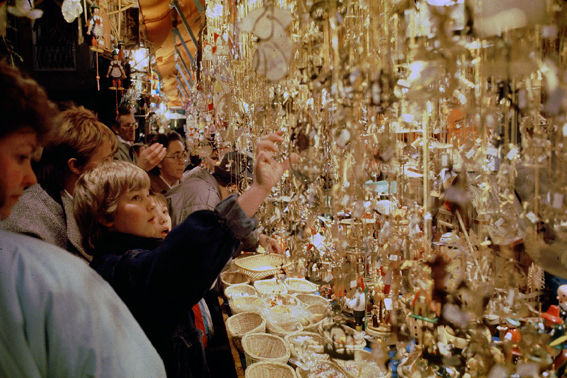 And reap their rewards: since 1981, the City has presented an annual award of gold, silver and bronze “Plum People” for the most beautiful stalls. 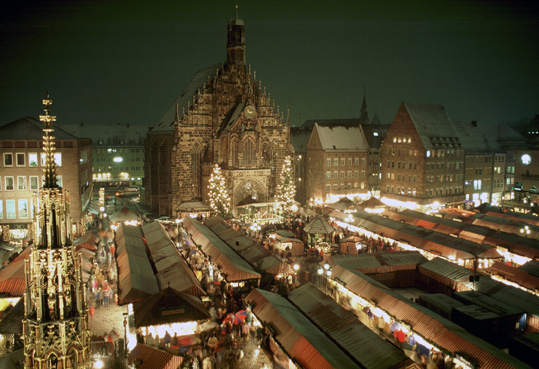 Nuremberg Christmas Market with its traditional image has also been a model for other Christmas Markets. The “Little Town from Wood and Cloth” has also been much in demand as a picturesque backdrop for TV productions.